I was fortunate to win a couple of prizes at this years Boonah show from this image. 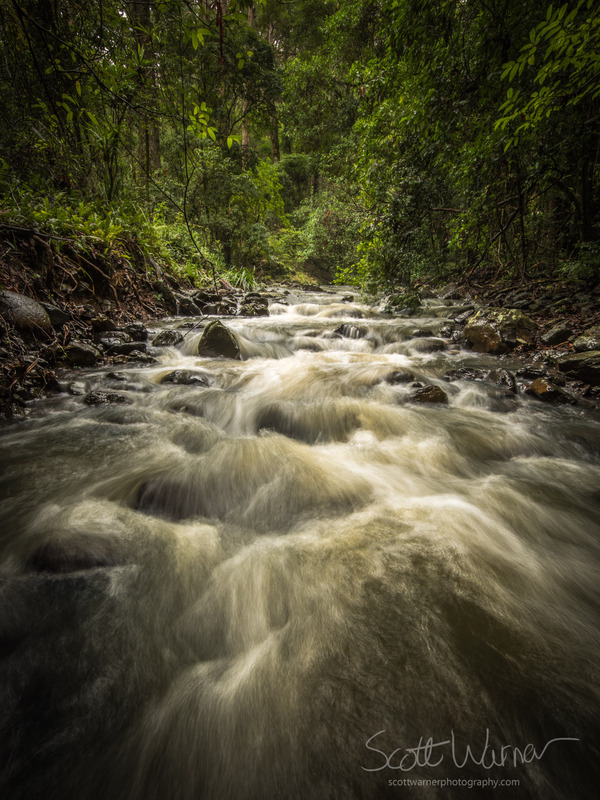 It’s a classic image of a high rainforest creek tumbling over the rocks on its way to calmer waters – except it isn’t, well not normally anyway. This little stream is seasonal and often times the water flow through here actually goes underground, emerging only where large rocky slabs break the surface. In fact just about a week before this I had come down the creek, walking down the middle with just a gentle trickle beside me. Unlike the story for of unexpected discoveries and being open to the things you didn’t plan, this shot is exactly the opposite. We had had several days of solid rain before this and much of it had fallen on the mountain ranges. I had walked this creek several times before and knew that with the right amount of rain it would look great. My final destination was actually a small waterfall which is just out of sight in this frame but the light just wasn’t right up there – you can’t have everything right. What I remember most about this is the initial battling through the dense underground of the creek bank which is lined with vines and thick scrub. You have to be careful to not walk into a Gympie Gympie bush, if you have had the pleasure you’ll know the pain to which I am referring :O. After a while I just took off my boots and walked up the creek, occasionally needing to walk along the bank for short sections. The soft, leafy undergrowth of the rainforest feels fantastic when walking barefoot, the loose rocky creek bed not so much. I was only up there for around an hour or so, having got the photo I was after and not wanting to fight the rain anymore. To take this shot I placed my tripod with it’s legs splayed wide to get maximum stability then set the camera to f16 for a deep depth of focus, 1/2 second exposure to get the rushing water feel and ISO100 to preserve as much detail in the image as possible. I actually had to put a fair amount of pressure down on the tripod to ensure it didn’t move during the exposure as the water was quite forceful. For me this photo is a good example of why I like to explore places again and again because the more intimately you know an area the more likely you are to know where and when to get a great shot. I hope you’re enjoying the stories, please feel free to comment below and to share. Loving the stories behind the pics.